The Family Panel Reviews : Gourmet Chocolate Pizza! The whole of The Family Panel love to find unusual gifts for their vast family members. 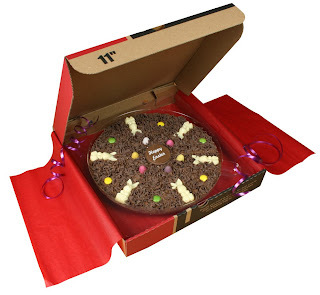 The latest quirky gift they have discovered is a Gourmet Chocolate Pizza. We received this just as 20SomethingMum was suggesting a good wander to the sweet shop. It definitely started a great deal of debate with Gadget Dad, and the Tot Testers saw chocolate and were very happy indeed! The Gourmet Chocolate Pizza Company is based online, and they supply Chocolate "pizzas" for every conceivable occasion, with reasonable delivery costs, and they are willing to deliver internationally as long as the purchaser checks with them first. They are handmade, as one would expect considering the "Gourmet" in the title, with luxury ingredients including Belgian Chocolate (in Dark, Milk or White) and, just like a savoury pizza, they can be made to your specification with a choice of toppings! The quirkiness comes from the fact that they are gift wrapped and sealed in a cardboard delivery box, just like a pizza take away box! Which will delight even the hardest to please. The chocolate is thick, with a crumbly chocolate sprinkled top, which simply melts in the mouth, and in the case of our Easter version came with white chocolate Bunnies and Easter Eggs in different colours- in fact Big Tot wanted to keep all the bunnies! The effect of the gift would be lost on smaller children, but if you have a tween or teenager who is growing out of the whole Easter experience, but you have younger children, so you don't want them to feel left out, this would be absolutely ideal. Or if you simply want to impress a choc loving friend or relative with something just that little bit different, which they wont forget in a hurry, then this is the ideal site to find that gift. Just like a pizza, they come in 7 inch, 10 inch or 12 inch, with prices ranging between 7.95 and 15.50. The range also includes mini 4 inch Choc Pizzas (3.50 each and again with a range of toppings), Gourmet Hot Chocolate (5.00 for 250g), and Chocolate Soldier and Star shaped Lollipops with a ribbon tied to the stick just to give that level of glitz (2.95 for two), the company really is the website for Chocoholics everywhere! We were very impressed with the quality of this, and urge you to visit the site. One word to sum the pizza up? YUMMY! What a good idea and they do look yummy, I'm quite jealous! I'm sorry but I would avoid this company at all costs. Average email response time of over a week and I ordered my goods over a month ago - still have not arrived despite repeated promises. Disgusting service.